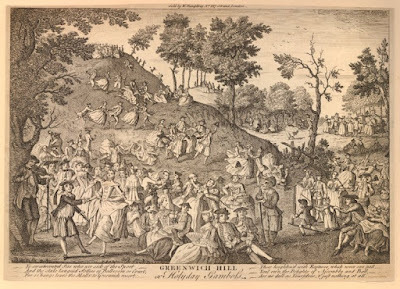 Greenwich Hill or Holyday Gambols, William Humphrey, 1770's, British Museum. The British Museum dates this piece to between 1740-1765. I disagree, because Humphrey wasn't born until 1745, and moved into his shop at 227 Strand (as advertised at the top of the print) around 1777. 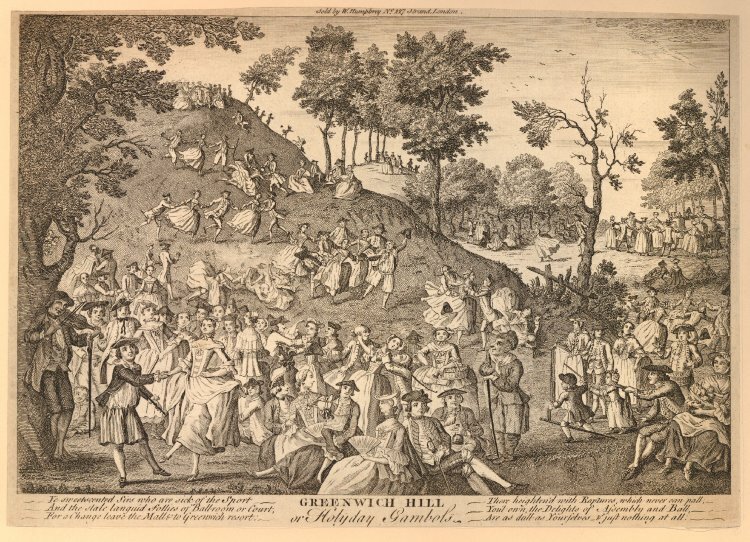 Elements of this print appear to be copied in C. Sheppard's 1786 print Greenwich Park, and so I would date it between 1777-1786, though leaning toward the 1770's due to the fashions of the men and women depicted. Are as dull as Yourselves & just nothing at all. 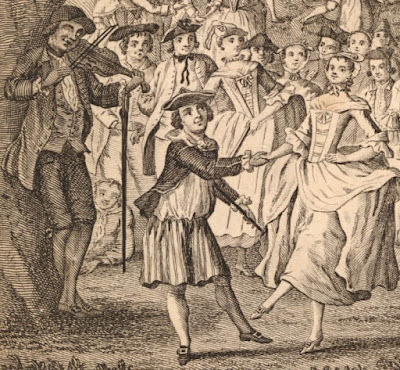 In the foreground on the right, a sailor dances with a pretty lass, to the delight of a gathered crowd and the music of a blind pensioner. The sailor's blue jacket with buttoned mariner's cuffs is piped with tape through the seams, and he is without a waistcoat. He wears the rare striped petticoat trousers and tucks a stick under his arm. Atop his bob wig is a cocked hat tripped with white tape. Behind the dancing couple are a few more mariners. One wears a suit with a reversed cockated hat, another is in a single breasted waistcoat, jacket, trousers, and cocked hat. Another rests on the ground in his jacket and neckcloth. 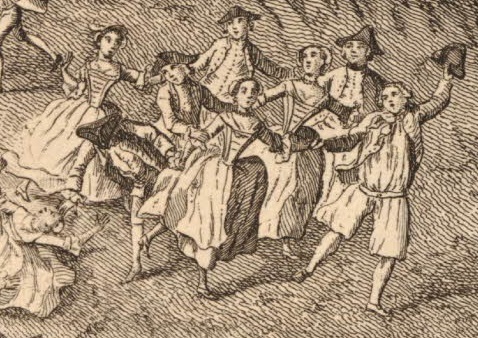 Groups of men and women run and tumble down the hill, with sailors interspersed among them. 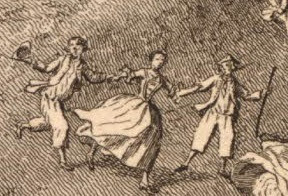 These two wear the same slop clothes: cocked hat, jacket, trousers that end about the top of the calf, and without waistcoats. One carries a stick. A brave tar leads the way here, waving his cocked hat as his neckcloth flutters from his neck. He wears a jacket, no waistcoat, and petticoat trousers. This odd looking fellow wears a Canadian cap, a large white neckcloth tied loosely, a single breasted jacket, and petticoat trousers. I'm not sure what to make of his stockings. They might be loose gaiters of some sort. He leans on the eighteenth century sailor's ever trusty companion: a stick. Hi Kyle. Your piece today coincides perfectly with a search for women's gowns with a tab(s) across the stomacher in the 1770s. And there they are. Lots of them! How were you able to get such a high resolution zoom? I went to British Museum site and it was pretty fuzzy when zoomed in. For images out of copyright, the British Museum allows you to "order" free high resolution copies. These are delivered straight to your e-mail inbox at no cost. Below the preview image to the right, click on "Use Image" and sign up through the prompts. Definitely worth it!